I love the photo, it could have made the calendar had I not mailed them today. Here’s to January and all it holds. I’m pulling for you! God Bless! That’s a picture of Miles I will soon not forget! 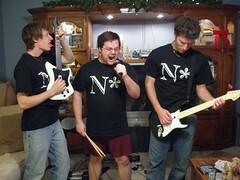 Awwww, those were the days when I was in a Rock Band™. Miles wearing the news anchor pants I see.